On this couple's engagement portrait wish list was to stop by world-famous Cafe Du Monde for some beignets. This is sometimes a challenging shot to pull off, as it's really best to use a table along the edges instead of one in the middle of the cafe, and this place almost always is bustling with visitors. Often the solution is to just hang out and watch for people at a suitable table who look like they might be about to leave, then pounce and try to snag the empty table before someone else does! Another alternative is to get the order of beignets "to go", and find another spot in the area to do the pictures. 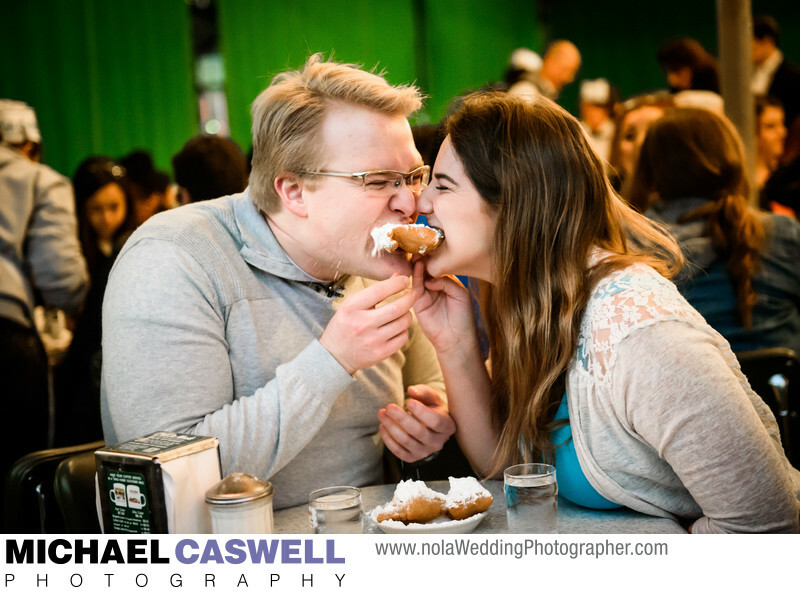 In either case, this shot of the couple taking a bite of the same beignet is a must-have. It's also fun to get a photo of the bride blowing powdered sugar into the groom's face! Sometimes this happens inadvertently, as it only takes a little breath, but more often then not the bride does it on purpose! Location: 800 Decatur St, New Orleans, LA 70116.